Home invasion on Sales Street in Murphy NC | Cherokee Co N.C.
Home invasion on Sales Street in Murphy NC. MURPHY, N.C. – Murphy Police Department Assistant Chief Dustin Smith has issued a Press Release regarding a recent home invasion on Sales Street. Six individuals of which three were juveniles were apprehended and charged with the incident. On March 2nd 2019 around 2:00pm Cherokee County Dispatch received a 911 call in reference to several male subjects running down Willow Street in Murphy North Carolina with a firearm. The subjects were screaming at each other to shoot someone. Officers with the Murphy Police Department along with Deputies with the Cherokee County Sheriff’s Office responded to the area. Officers arrived on scene and learned that a home invasion had just occurred on Sales Street in Murphy North Carolina. The individuals with the firearm running down Willow Street was identified as the suspects in the home invasion. Due to the location of the incident in relation to the area schools and the suspects fleeing on foot with a firearm for safety reasons the local area schools (Murphy Elementary School and The learning Center) was notified of the situation and decided to place the schools on a code yellow status. Officers began looking for the suspects in the area and arrested one individual after a short foot chase. Several other individuals involved in the home invasion fled the area in a vehicle but was shortly apprehended in Union County Georgia. During the investigation Officers learned that six individuals were involved in the incident and three of which were juveniles. The juvenile names cannot be provided in this release. Jordan Tyree Mackey DOB: 04/06/2000 B/M Address:1086 Jones Creek Road Blairsville GA was arrested in Murphy NC and charged with Attempt Robbery with a Dangerous Weapon, Felony Breaking and Entering, and Conspire to commit Robbery with a Dangerous Weapon. 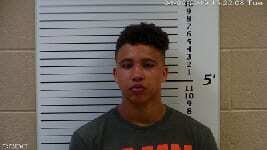 Mackey was booked into the Cherokee County Detention Center and was given a $30,000.00 Secured Bond. Jordan Tyler Patterson DOB: 04/24/2002 W/M Address: 82 Murphy Drive Blairsville GA was arrested in Blairsville Georgia with pending charges in Georgia and pending charges in North Carolina for this incident for Attempt Robbery with a Dangerous Weapon, Felony Breaking and Entering, Conspire to Commit Robbery with Dangerous Weapon. This case is still currently under investigation and further arrest and charges are still possible at this time. If anyone has any information about this incident they are encouraged to contact the Murphy Police Department at 837-2214. I would like to thank everyone involved for a fast and safe resolution in this case.